The Eve V is the first ever crowd-designed computer by more than 1,000 minds of the Eve community. After the successful launch of the Eve T1 tablet, Eve Tech Finland was still unsatisfied. It decided to establish a community where people collaborated to create the Eve V. The project was even code-named Pyramid Flipper. 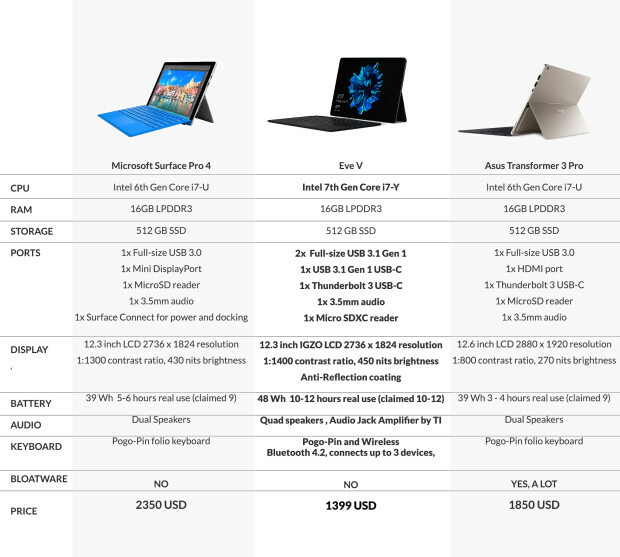 The device is even being touted as a direct competitor of Microsoft’s Surface Pro 4. What makes Eve V so special? Considering it was co-created by so many people, it’s natural to assume there were a lot of ideas. The result? An excellent piece of two-in-one hardware at an incredible price. For starters, it comes with a 3.6GHz seventh-generation Intel chipset with up to 16GB of RAM. The processors claim to be extremely energy efficient and 100 per cent silent without a bulky cooling system. There’s also a reported 12 hours of battery life. The device is features an eye-catching IGZO display. The 2,736×1,824 LCD is also anti- reflective to ensure top notch viewing no matter how sunny it is. Eve V is bonded with Gorilla Glass for safety and to keep those pesky scratches away. This being a two-in-one device, the keyboard is detachable and wireless. Audio is pumped by quad speakers and an amplifier dedicated to the headphone jack. Two USB 3.0 ports, one USB Type-C port and a Thunderbolt 3 port complete the package. Microsoft and Intel have invested in the Eve V by pooling their resources. 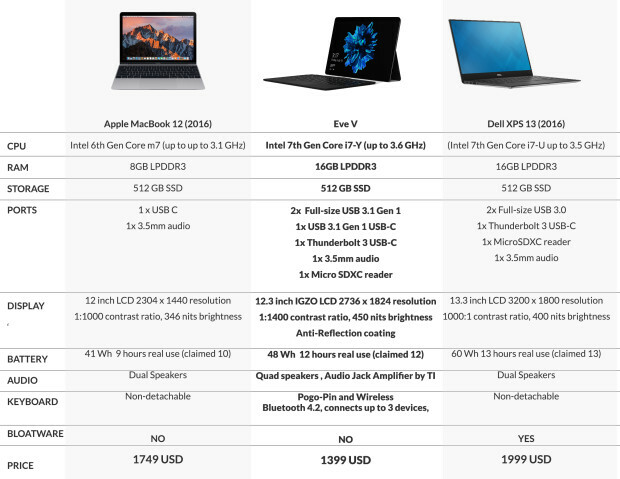 Microsoft provided Windows 10 and its hero features to the computer, while Intel helped the device achieve optimal thermal performance and added the Thunderbolt 3 with external graphics support. If you need to get your hands on one, head over to the Indiegogo page and reserve your unit. There are 24 days to go.